1) The boys got their H1N1 vaccination yesterday. After the kefuffle that the Alberta Government's Health Ministry created last week with mass clinics, I was thankful that they backed off, regrouped and came back with a better plan to immunize high risk groups first. And apparently it's working - no more 6 or 7 hour lineups. We went to the Olympic oval and were done within 45 minutes. Much better. I am just glad they were able to get it, what with the possibility of running out of the vaccine etc. They do have to go back in three weeks (Nov. 26) for a second dose, so I am hoping that it will be as easy then! SO far they have had no reaction, although most kids apparently complain of sore arms more than anything. One thing I have learned about Grayson and I is that he doesn't respond well to me being the teacher. 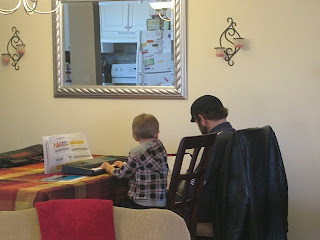 This was the case when I was trying to teach him how to write, and again when I attempted to teach him about the piano. I took lessons and played piano in my formative years so I thought I would be able to teach him at least the basics. But when we sat down together he balked and didn't want to listen or try anything I suggested. We both got frustrated and gave up before the lesson had really even started. So although I had harboured dreams of homeschooling my children, I don't think it's gonna happen! 3) I am baking bread. Yes, real bread, from scratch., no breadmaker. I came across a link to this video produced a few years ago by the NYTimes. It features Jim Lahey making his super simple no-knead bread. It's so simple he says a child could make it. His secret? TIME. So I started it last night and should be ready to move to the next step after 9:00 this morning. I'll let you know how it goes, but in the meantime watch this and get inspired to make some yourself! 4) I forgot to share this on the blog, but this past Halloween I found, puchased and gave out a few of these cookie treats to some special kiddos. These fun little cookies are by KookieStationary, a local company from Canmore, Alberta. 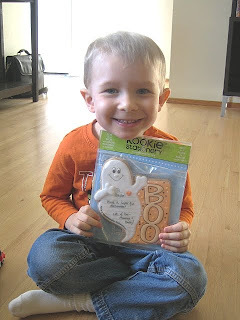 I first saw the cookies at the Creative Craft show back in September and grabbed a few of the Halloween themed cookies. 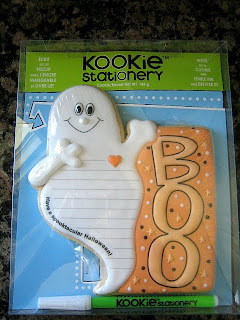 The cool thing is you can write on them with the included pen (the ink is made of vegetable oil and is completely edible) before you give them away! And they have lots of designs for every occasion - inlcuding some really cute Christmas ones. You can buy them at some locations in and around Calgary (check their website for retailers) or order directly from them online. So fun! 5) Since deciding to take an extra year off of work we have adopted a more frugal lifestyle while living on Shane's income. I have always enjoyed getting a good deal but recently have started being more aware and watchful of coupons, freebies and sales. 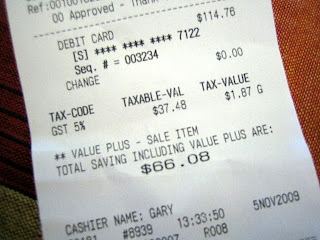 I was so proud of myslef when I was able to save $66.08 off my groceries yesterday! Between the 10 for $10.00 sale, regular sales, CO-OP gas coupons, instore coupons and vendor coupons I watched the total on the cash register drop and drop and drop from $180.84 all the way to $114.76! Amazing! I have to say I felt like a very thrifty little housewife! Simply Frugal posts several times a week on Canadian coupons and deals in Canadian stores. Small Notebook inspires me to embrace a simpler, less materialistic life. I love the No-Spend July she does! Simple Mom offers tips to stay organized and therefore spend less. Love this blog. Do you follow any good sites on living a frugal live? Do you have any suggestions or tips? I would love to hear them.